Tailor-made for the family on the go, compact crossovers promise a versatile, athletic design that is complemented by an affordable price tag and frugal fuel-economy ratings. A pioneer in the compact crossover segment, the Toyota RAV4 has been a fan favorite for generations due to an athletic style, an energetic powertrain, a spacious, family-friendly interior, next-generation technology, unrivaled safety and an affordable price tag. Learn more about the Toyota compact crossover and how it is an upgrade over the competition with this 2018 Toyota RAV4 vs 2018 Nissan Rogue comparison. Families who have come to love the 2018 Toyota RAV4 platform will have a choice of six value-packed trim levels – LE, XLE, Adventure, SE, Limited and Platinum – that can be tailored to fit your lifestyle. 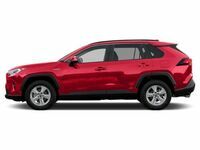 Toyota RAV4 models make room for five passengers in a cabin that provides 101.9 cubic feet of passenger space and employs a standard Toyota Entune™ infotainment system with a 6.1-inch touchscreen, Bluetooth, a rearview camera and more. Toyota Safety Sense™ technology is an added asset that adds a Pre-Collision System with Pedestrian Detection, Lane Departure Alert with Steering Assist, Automatic High Beams and Dynamic Radar Cruise Control. What Are the Differences Between the Toyota RAV4 and Nissan Rogue? Are you looking for a family-friendly compact crossover that will check all the boxes? The Toyota RAV4 will fit the bill in this 2018 Toyota RAV4 vs 2018 Nissan Rogue comparison at Downeast Toyota. With a price that starts at just $24,510 and an arsenal of standard amenities that include Toyota Entune™, Toyota Safety Sense™, Bluetooth and more, the Toyota RAV4 promises tremendous value. Nissan Rogue variants start at $24,800 and employ a similar set of amenities. Power, performance and versatility are highlights of the Toyota RAV4 design that will set the Toyota crossover apart from its Nissan competitor. Gas-powered Toyota RAV4 variants employ a 176-horsepower 2.5-liter four-cylinder engine that is married to a six-speed automatic transmission to make 23 mpg in the city and 30 mpg on the highway. Available Dynamic Torque Control AWD will upgrade performance when faced with winter weather and poor road conditions. When properly equipped, the rugged Toyota RAV4 Adventure grade will tow an impressive 3,500 pounds of cargo – numbers that the Nissan Rogue cannot match. 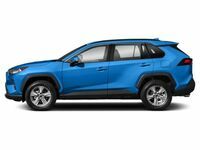 Drivers who put an emphasis on fuel economy can opt for the RAV4 Hybrid armed with a 2.5-liter four-cylinder gas engine and electric motor combination that will make 194 horsepower in addition to 34 mpg in the city and 30 mpg on the highway. When you add 38.4 cubic feet of cargo space behind the second row that will expand to 73.4 cubic feet with the rear seats laid flat, the Toyota RAV4 and Toyota RAV4 Hybrid are tailor-made for family adventures. Nissan Rogue variants play host to a lackluster 170-horsepower 2.5-liter four-cylinder engine that pairs with a Continuously Variable Transmission to maximize fuel economy. Intelligent AWD is available as an option that will upgrade performance. If fuel economy is your focus, the Rogue Hybrid variant possesses a 2.0-liter four-cylinder hybrid power core that makes a humdrum 176 horsepower and achieves 33 mpg in the city and 35 mpg on the highway. When equipped for towing duties, the Nissan Rogue will tow a disappointing 1,100 pounds of cargo. A spacious cabin provides 39.3 cubic feet of cargo space behind the rear seats that expands to 70 cubic feet with the seats laid flat. Visit Downeast Toyota today to find the 2018 Toyota RAV4 model that best fits your lifestyle and budget!